Yesterday evening, I decided that making dinner and photography should be combined more often. As a result, I dragged my camera, the 70-200mm zoom, the flash, and the tripod to the kitchen to try my hand at taking some photos of scrambled eggs—or to be more specific, scrambled eggs as they were cooking. The fully extended tripod left the Arca-Swiss plate about nose-level. With the D750 with the 70-200mm on top, the LCD on the camera was just above my head. The swiveling LCD on the camera was rather useful and made it significantly easier to review test shots, and mess with the flash output. 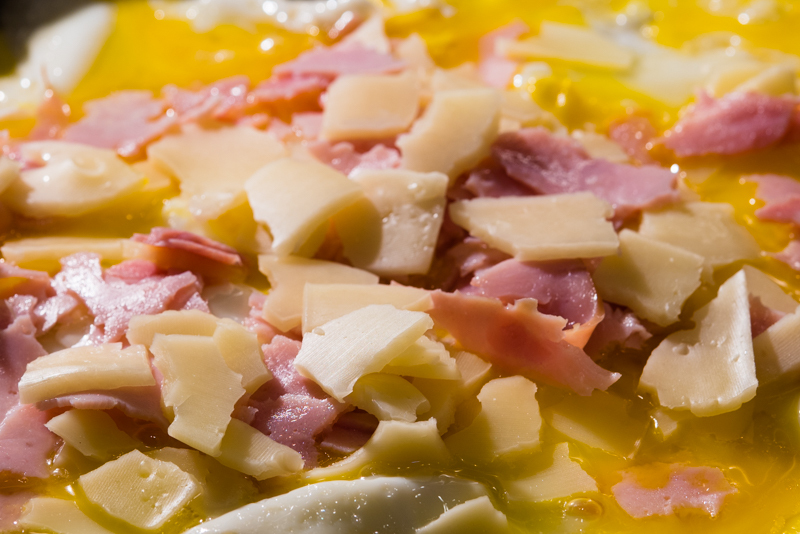 As far as the food itself is concerned, I prepared two bowls—one with five cracked eggs, and the other with some shredded ham slices and swiss cheese slices. 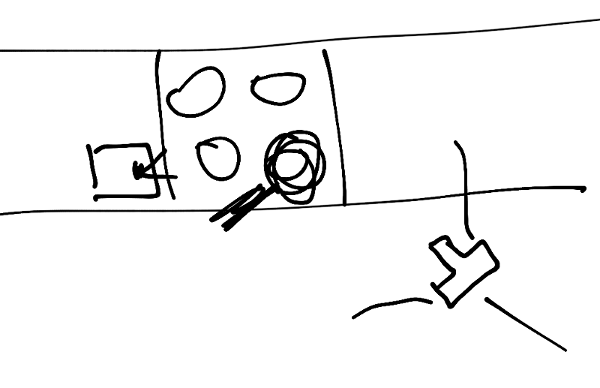 Here is a (terrible) diagram showing the setup from above to better explain it. The four-circle thing in the middle is the stove, with the skillet on the bottom right burner (the scribble with a handle sticking out). The camera on the tripod is in the bottom right corner of the diagram. To the left of the stove is the flash. It’s on top of a cardboard box that the 70-200mm came in. Above the stove is a stove hood with a couple of lights pointing down at the stove top. I used a wooden spatula in the otherwise empty skillet to have something to focus on. After I got the focus right where I expected the food to be, I switched to manual focus. In the process of taking those test shots, I ended up concluding that I need both the flash and the stove hood and kitchen lights to get something resembling the right kind of lighting. Of course the kitchen light color temperature did not match the flash, so I grabbed the orange gel and put it on the flash. (This is the first time I used a gel on a flash!) It worked. It was time to start cooking! Once the bacon grease on the skillet got hot enough, I poured the eggs in, and quickly moved to the camera to get some more test shots—to make sure that the exposure, focus, and composition were good. I ended up tweaking the focus and flash output. After I scrambled the eggs a little, I dumped the ham and cheese on top and moved it around a bit to avoid a large mountain of ham and cheese. Then it was time to go back to the camera—to get the final shots. Even though I was zoomed in near 200 mm, I ended up cropping significantly to get the shot I wanted. I suppose this would have been a good time to use a macro lens (which I do not have).